As a Jewitch, I am often asked what is the critical difference between magic and mysticism? and how can I resolve practicing witchcraft against the Torah's seeming prohibition on witchcraft with the claim that I am a Torah observant Jew? There is a chapter in a book by Adin Steinsaltz (The Strife of the Spirit) which discusses the traditional rabbinic view of magic and mysticism, between that prohibited by Torah and that allowed by Torah. In this chapter, Rabbi Steinsaltz explains that the critical difference between Torah-prohibited magic and Torah-allowed magic all comes down to who does it and from what level the power comes. Engaging in magical pursuits, from a rabbinic perspective, is dangerous until one reaches a certain "madreiga" or spiritual level of developmental maturity. Prior to attaining that level, the rabbis believe that a person can become fascinated with power (that is, trapped by enchantment) in such a way that a person's continued spiritual development is impeded. The rabbis recognize that oftentimes many of the powers associated with witchcraft naturally unfold as one evolves spiritually, but also recognize that powers may also unfold prematurely leading to a detrimental enchantment with power. In other words, a person is liable to become trapped by an enchantment with the very real power released through magical-mystical practices such that he or she becomes confused and deadlocked spiritually. For this reason, rabbinic tradition discourages magical/mystical pursuits, and in my opinion, has misled laypeople as to what the Torah actually teaches about magic and mysticism. Interestingly, the situation in traditional rabbinic Judaism today suggests that many rabbis are indeed confused spiritually and trapped by an enchantment with power. Enchantment of a whole group of people is not unheard of in the occult mysteries. In Celtic magical-mystical tradition, the story of a whole city's enchantment is told in the first branch of the Mabinogion in the tale known as The Enchantment of Dyfed. In consequence to enchantment, except for four individuals, the lives of all of the city's inhabitants became suspended. In other words, they became spiritually deadlocked not too unlike rabbinic Judaism today. We cannot always judge what is permitted and what is prohibited by the labels we put on practices. Sometimes we can only make a proper judgement as to what is prohibited and what is allowed by its effect upon us. I note as an interesting side observation - as with the Judaic tale of the Exodus, the number four figures prominently in the Celtic tale of Dyfed as well. Another baby of the Robin family has raised its cute wee head up to examine its world! 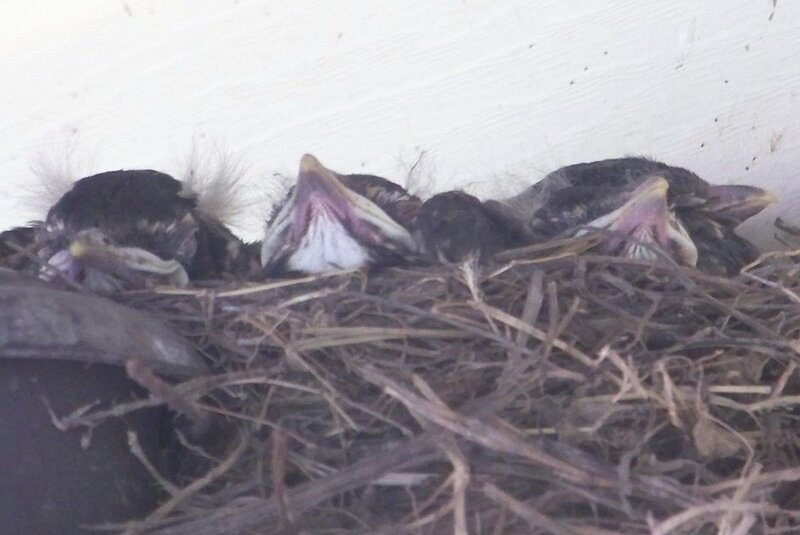 Here is a photo (click to enlarge) I took of the four babies in the nest this morning. A multi-faith blog exploring religion (You, Me & Religion) will be posting an interview they requested of me, scheduled for publication December 24th. I just emailed my answers to the interview questions I was asked to the blog owner, so I'll share the interview here with my friends and readers as well. Online, I typically am known by the name Liorah Lleucu / Myfanwy. I am fifty years old, a divorced mother of 3 adult children and grandmother of 6 grandchildren, with my seventh grandchild on the way. Both a registered professional nurse and a biochemist by education, I was born and currently live in the Midwest. I am a Celtic Jewish American with Welsh, British, Irish, Germanic, Jewish and Native American ancestries. My maternal ancestries are Welsh, British and Jewish. My paternal ancestries are British, Irish, German and Native American. 1) What religion do you practice? Jewitchery to put it into one word. I am an eclectic witch whose nature-based ritual practice combines elements of Celtic Witchcraft and quasi-traditional Kabbalistic Judaism, with splashes of Germanic Paganism and Native American Shamanism thrown into the mix - the ancient traditions of my Ancestors. My religion is idiosyncratic and doesn’t fit neatly into any category, but Jewitchery is a term that most closely describes my religious practice. 2) Are you a convert/revert or were you raised within this religion? If you converted, what did you need to do to convert? And what did you practice prior to converting? This is a complicated question for me to answer. I wasn’t raised a Jewitch, but I was indeed born one. Raised Christian, I rejected Christianity as a religious path for me in my late twenties or early thirties, and returned to Torah (the tradition of my Jewish ancestors) in 1996 (formally through a Beit Din and mikveh immersion in 1997 under the auspices of the Reform Judaism movement), from there, progressing my study of Judaic Kabbalah and Jewish Law in Liberal to Hasidic environments. Not raised Jewishly, as a Reform Jew at the time of my return to Torah, I ritually converted. My mother’s mother’s mother’s mother and father were both observant Jews, so halachically (by Jewish religious Law), I am Jewish by birth and according to Orthodox ways, conversion was actually unnecessary to reclaim my Jewish heritage as part of the Jewish people. I reclaimed my Celtic heritage, my place among the Celtic people, and returned to Witchcraft (the tradition of my Celtic ancestors) in 2006 (formally through a self-initiation ritual), combining both ancient Ancestral traditions (Judaism and Witchcraft) into a spiritual path uniquely fit to me, best described by the term Jewitch. At this point in my journey, my concept of the Divine is pantheistic-atheistic (similar to Reconstructionist Judaic conceptions of the Divine, I believe), naturalistic, earth-based and as a woman, focuses on Divine Feminine constructs. My studies and practice currently focus on traditional herbalism, artisan craftwork, meditation, Torah study, study of mythic folklore, and using mystical alphabets to channel creative consciousness. Sacred alphabets I work with are Hebrew, Ogham and Runes. 3) Within your religion are there degrees of observance (ie. Orthodox,conservative, moderate, liberal)? What are the defining differences between the degrees of observance? Certainly. There are other Jewitches but many, if not most, were raised in Judaism, unlike me. However, like me, in Jewitchery they are reclaiming the pagan and shamanic heritage of our Ancestors - so in that way, we are the same but arriving as Jewitches from different angles. 4) Within your religion what degree of observance are you (ie. Orthodox,conservative, moderate, liberal) ? Why did you choose this degree of observance? I’m a mutt. In some ways, I am all of these. I’m artistic and very mystically oriented, so I lean toward meticulous metaphysical Orthodox observance. I’m a rationalist, so I tend toward a liberal religious emphasis on ethics and critical thinking. I live in the Bible belt, so I’m a realist and recognize that my observance level is unavoidably subject to my surroundings and circumstances. I’m an anomaly. I was born remembering my soul journey into physical existence and the entire story (in a very wholistic sense) of my Being. There is more to what we are as human beings than may be discerned while within a physical body. I do not remember either a heaven or hell as commonly taught – such is not my experience of Being. More than this I will not say. 6) In your opinion, does everyone make it into heaven/paradise? If they do not, why? I don’t believe in heaven and hell as commonly taught, so no one, in my opinion, makes it to either of them. Based on my experience and remembrances, I do believe that every living creature is an amazingly rare and treasured spark of the Divine who made it into physical existence against highly improbable odds. So, my experience of remembering informs me that the existence of every living creature is a miracle whose full value is totally beyond normative comprehension. Every living creature is an indispensable part of the Whole, and to where we are going, we will all surely arrive. 7) What makes your religion a good fit for you? Because it allows me to be true to myself, to evolve, and to get to where I am going. 8) What are your holy days and what do you do to celebrate them? 9) Do you consider people of other faiths to be your friends? 10) Would you ever join people of another faith to celebrate one of their holy days? Please explain why? It would depend on the context and purpose. I value interfaith sharing within a context of mutual respect. 11) What are your thoughts on the burka, and Shariah Law? I really am not qualified to make a fair comment on either of those things. These two things exist within the context of a culture and religion which is not my own. 12) Are women allowed to hold religious office (priest, minister, rabbi, iman etc) in your religion and how do you feel about it? 13) Does your place of worship segregate? If yes, how does this make you feel? I honor the Divine in private spaces generally. 14) How much does your religion affect your daily life and how much thought do you give it when making a decision? Does it affect in any way your decision on abortion, gay marriage, etc? The very act of breathing is a religious act for me – there is no separation between my daily life and my religious life. 15) How would you react/feel if your child wished to marry outside your religion? My adult children do not identify as Jewitches and are raising my grandchildren a Christians. I honor the right of my children to choose their own path toward Divine consciousness. We are all different as human beings, yet even so, we all share a wonderful ultimate human Destiny, so I’m not worried. 17) In your opinion, if someone is not of your faith, will they go to hell? No. I don’t believe in hell. 18) Who do you think is not a practicing ----- in your religion and why? ie who in the public domain claims to speak for your religion? Do you agree with them or not? 19) Have you ever been the target of a hate crime? Please explain. A hate crime – no. Illegal discrimination – yes. I’d rather not explain. It’s complicated and not useful to any discussion here. 20) Do you ever feel like your religion devalues you? 21) Does your religion give you peace of mind? Yes, absolutely – peace of mind and more importantly, deep joy. 22) Do you believe in reincarnation? Why or why not? 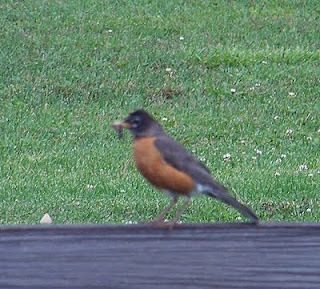 In follow-up to this week's earlier posts on the Robin family - there are actually three baby robins in the nest, not two! The third one stuck its head up over the side of the nest today! In follow-up to today's earlier post about the family of robins nested above the back porch light, after their parents brought them lunch, it was naptime for the baby birds. Here are pictures of the babies before and after their little tummies were filled. Look at the cute tufts of baby feathers on the top of Robyn's wee head (click the photo to enlarge) - so cute! 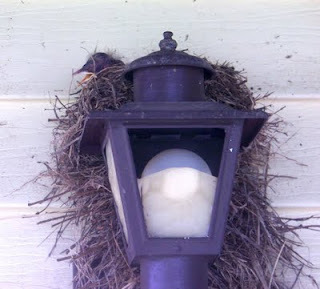 Here are some photos I took this afternoon of the family of robins who have a nest atop the back porch light. You can see in one of the photos how close the light is to the frequently used back door. 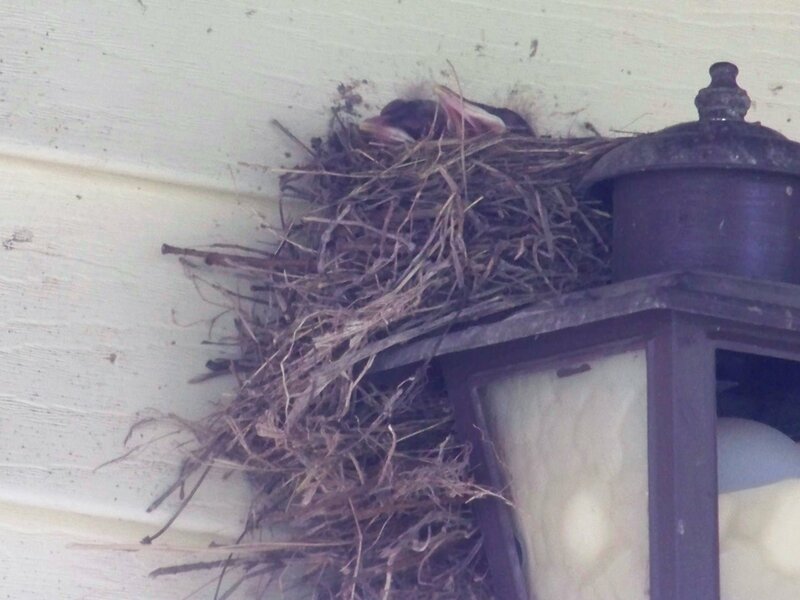 There are two babies in the nest. 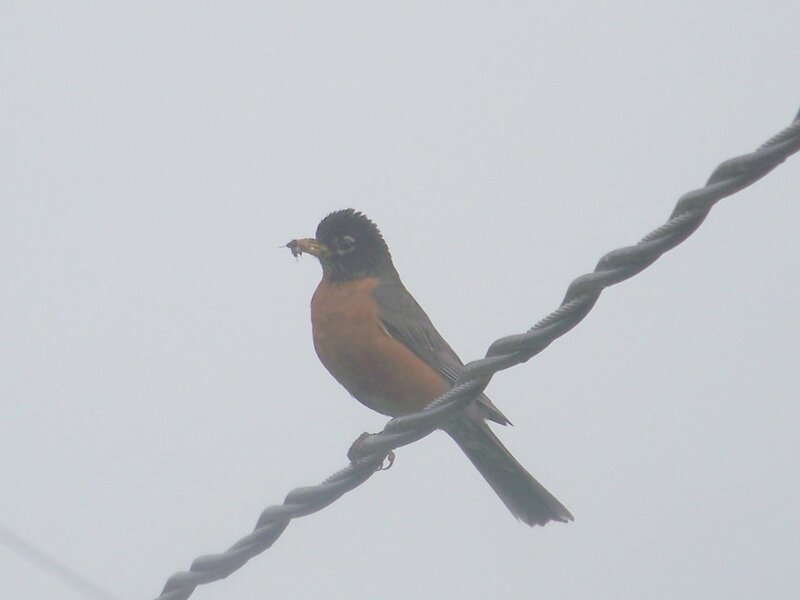 I caught images of the two parents as well - they are bringing lunch home! 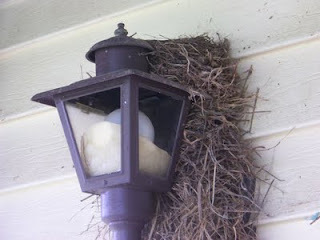 A few weeks ago I posted that a pair of robins had built a bird's nest over the back porch light where I live. 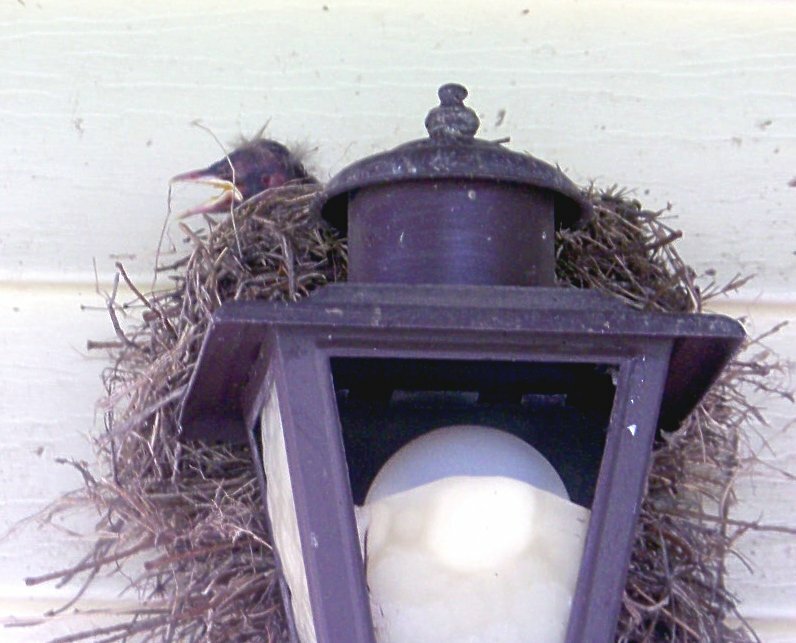 Well now, there are at least two baby robins in the nest. 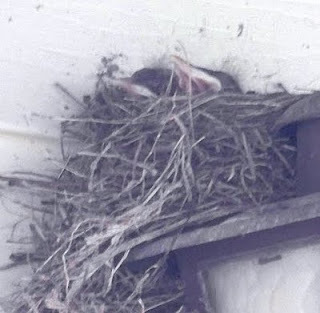 Yesterday, two of them had their necks extended up high enough over the top of the nest that I could see them. 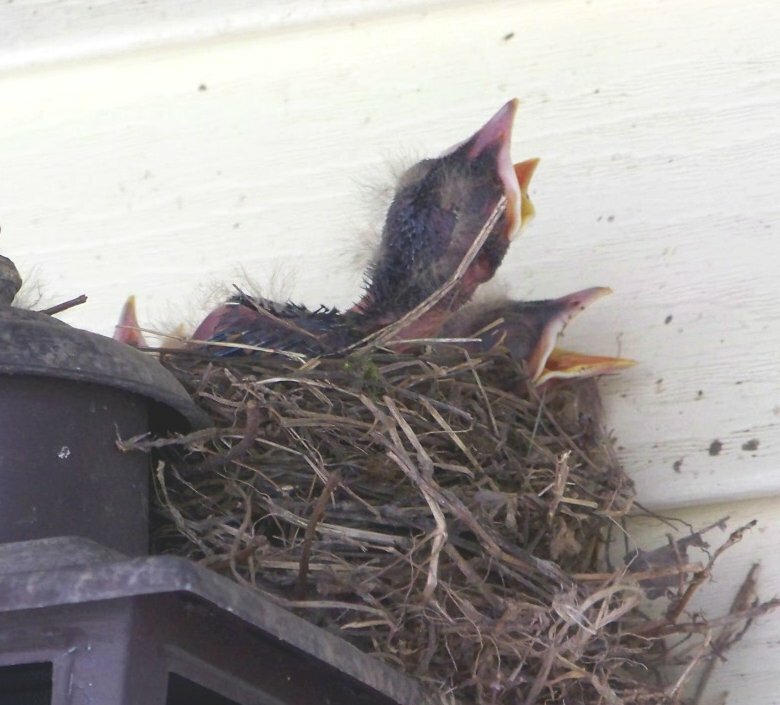 They had their mouths wide open up in the air, making noises, waiting for their parents to bring them some food. Today, they were sleeping. 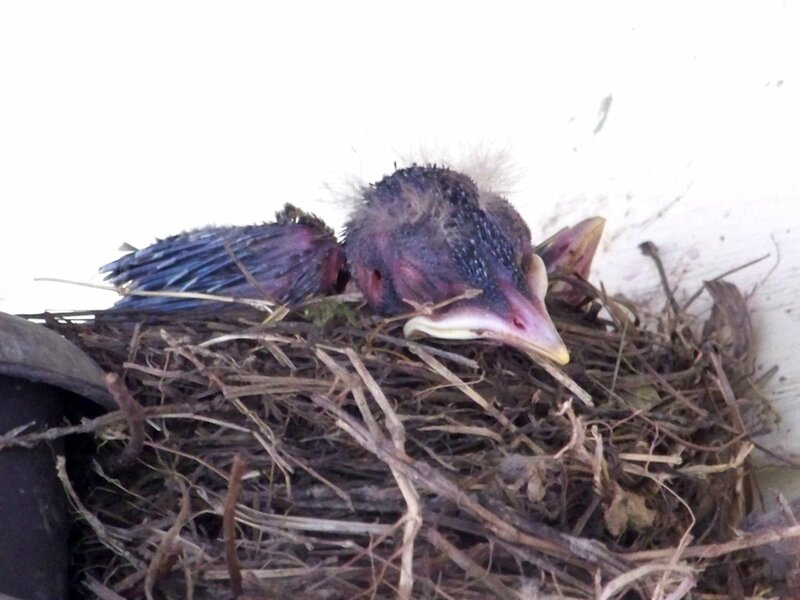 One had its head resting on the top side surface of the nest, asleep for awhile. It was so cute and so at contented peace. 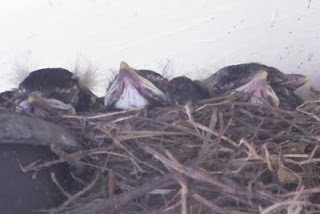 You know, you can even see contentment and peace in the expressions of baby birds. I'll try to get a photo of them tomorrow. Last night before bed, after I created and listed this ENEIT oil at my Etsy shoppe WITCHCRAFTS and on my shoppe blog, I did something I haven't done is several months. I blindly reached in and drew a mystical rune from my runebag to see what cosmic energy was afoot in my world, according to my magical runes. I drew Kenaz, in complete synchronicity with the oil I had just created. Kenaz is the rune of the artisan craftsman and of the master of the technical aspects of magic, knowledge, cunning, creativity, illumination, observation, intellect, skill, occult female secrets, controlled fire and kinship. Kenaz is the torch of enlightenment. Kenaz is clarity. Also symbolic of the teaching-learning dynamic and study, this Kenaz rune drawing was also synchronous with my dream from earlier this week, namely Lamed, where the magical Hebrew letter Lamed (ל) is likewise linked to the dynamic of teaching-learning. As with Lamed, Kenaz symbolizes Divine Inspiration. As with Lamed, Kenaz symbolizes the power to control the fire which fuels creativity. There is wholeness in harmony. Now, I have a clear thought about holiness. Interestingly, this insight, brought into focus through the complexity of Kenaz, was born from the pentacle number five, the Hebrew letter hei (ה) and the Middle Welsh word ENEIT. Peters, safely aboard the plane, sits down next to Jones (Carol Florence), one of the lead scientists from the future, who tells him that she is in "insurance". Viral can be bad or good, depending on the information or energy spread. What can't be fixed is the fact the something will indeed "go viral," but that "something" is yet to be determined. That same commenter commented on my post Wrestling with Destiny. He suggested that I may have been wrestling with chaos in that dream, which makes sense to me. At any rate, I won the wrestling match, which is a good sign. So far, so good. Perhaps I am, like Jones, in "insurance." Perhaps it is up to me who sits in the seat "Peters" occupied in the film, and it is up to me what goes viral. Because I have the luxury of knowing in advance that whomever sits in that seat next to me holds the future in his hands. Necessarily then, I am guarding that seat. There were several rows of seats. I was sitting in the twelfth seat. The thirteenth seat, on my right, was empty. Last night I dreamt, several connected dreams in fact, all seemingly different in symbolism, but each flowed seemlessly into the next. I was a young mother. My 'young son' was in his bed (in my current bedroom), but didn't want to go to sleep because there was a scary female spirit in the room. I couldn't see the spirit he saw, but I believed him and asked him where the spirit was located in the room. I was going to drive her out. He pointed up near the ceiling and told me she was there. 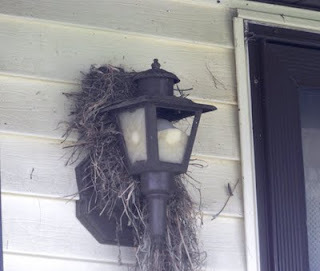 I flew like a spirit myself to the place where my son had said she was and began trying to exorcise her from the room, but she kept moving around - each time she moved away from me, my son would tell me where she was and I would move toward her again. Trying to drive her out, I told her she could never be fixed. 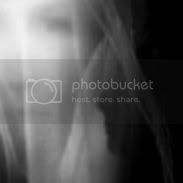 Finally I saw her myself (she had dark hair) and then her spirit jumped onto the left side of my face and merged with me there. Okay then, I thought. She was trapped with me now, and I'm in control. She's in me and I'm in control of her. She couldn't fly all over the room anymore and scare my son now. 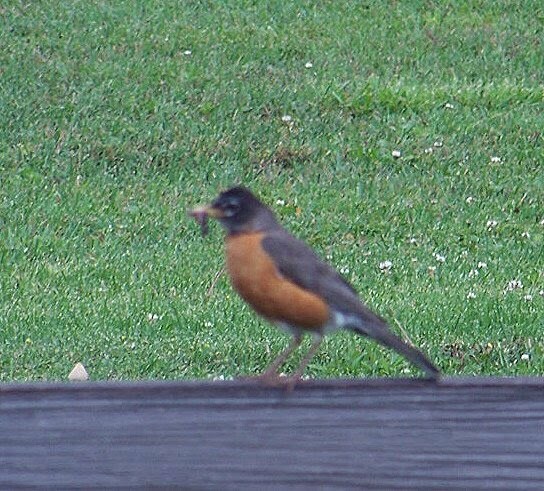 My 'young son', my 'husband' and I were outside in the yard. My husband was chasing a large mouse, it looked like a small rat to me, but my husband said it was a mouse. Okay then, I believed him. Even in the dream, I remembered the mouse I saw in my closet as a young girl in 1967. I hovered in the air, like on an invisible magic carpet, over the mouse so as not to touch it. I didn't want to touch it and become contaminated (in some way). My husband was trying to catch something (the mouse that looked like a rat, I think) and was hiding in the Tiger Lily bush at the northwest corner of the property like he was a hunter staking out prey. My 'father' drove a semi-truck over a bridge and over the left side of an embankment (right off the bridge on the south side of town) to keep it from crashing into other cars on the road. The brakes had stopped working while on the bridge. The truck rolled to safe stop at the bottom of the embankment in a parking lot near the shore of the river. I traveled back to before time, before the entire cosmos was created. I was pure consciousness observing. It wasn't dark, it wasn't light. There was nothing, but it was everything that could ever be and more. I restricted the mass of the packed full nothing I perceived and in the middle of my awareness a space emerged with things of creation swirling and floating in it - galaxies, a universe, a book, a city, a fountain, main street in my town, ... I was amazed that such little things came out side by side with immense things in this space in the midst of All Being. I wondered, back before the beginning, when in time these things would unfold into existence, but I knew they already existed, for I had already experienced them in the life that I have now (even though that life was not yet created in the place where I was). I paused in thought. Now is the only time that has ever existed. There is only now. The past is an illusion, the future is an illusion, time is an illusion. There is only now. Ok, then. Now I have to figure out how to cast things into that cauldron in consciousness that I want to be, and how I want them to be. First thing, I want a very special cauldron. Now.